President Obama issued an executive order Friday, creating a group to coordinate natural gas policies among at least 13 federal agencies. NEW YORK (CNNMoney) -- President Obama issued an executive order Friday, establishing a meeting of the minds to work on natural gas policies for his administration. The executive order creates a new working group made of representatives from at least 13 government agencies, including the Department of Defense, the Department of Energy and the Environmental Protection Agency, among others. Its main task? Keep the various federal entities all on the same page when it comes to developing new policies and regulations surrounding shale gas. Part of their focus will also be on hydraulic fracturing, or fracking for short -- a controversial technique that uses vast amounts of chemically-laced water, sand and pressure to crack shale rock and release the gas. Environmentalists fear the process, which occurs thousands of feet below the earth's surface, could contaminate ground water. And with that boom, the clash between the environmental groups and the industry -- which is wary of excessive regulations -- have intensified. Obama called business leaders from various groups including the American Petroleum Institute, the U.S. Chamber of Commerce and the American Chemistry Council to the White House on Friday to discuss the plan. In statements released by the White House, many of those groups said they welcome the president's call to streamline the country's energy policy, especially because they hope the working group will prevent redundant regulations. 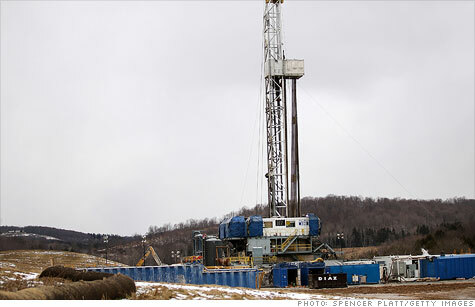 Several groups were also quick to point out that they prefer states to remain the primary regulators of gas activities. "There are already strong state regulatory systems in place," Jack Gerard, president and CEO of the American Petroleum Institute said in a statement. "Adding potentially redundant federal regulation could stifle the kind of investment that has led to lower energy prices for consumers, more American jobs, and increased energy security."